Welcome to the 2012 Army Swap!!! Up to the important part!!! The swap amount DOES NOT include the price of shipping. Do not cheat your swapper! Make sure the ponies equal to the swap level or if anything, exceed. Shipping is out of your pocket! - References are only for trading and selling ponies. - Ebay does not count but if you are short one reference it may help. - You need at least 10 references. - No first time swappers, you must have been in at least one swap before. - Pose armies and set armies are allowed. But this means you could get doubles. - No colour armies, this is no colour swap. - No accessories armies, this is no accessories swap. - Your wishlist may not contain more than 3 different ponies/poses or two sets. - You may combine sets, poses and single ponies but not more than 3 different armies. - If you choose more than one pony you need to have an army of each of these ponies/poses already. - Army means 3 ponies or more. This also includes variants. - Choosing more than one pony/pose/set does not mean you will get some of every pony/pose/set. Your partner chooses the ponies you will get. - If you have no pony army yet and want to start one with this swap you may only choose one pony/pose/set. - Let me know if you only want the original pony and/or which variants. - If your pony is a release in several generations please let me know which generation you want. - No ponies that are over the swap amount, this means no Mimic armies for example. - No super HTF ponies that only pop up like once in year. - Your wish lists are final. I can not take changes to them once they have been sent to your partners. Please keep this in mind. Please read the rules and do not join the swap if you cannot follow them. - A swapper cannot withdraw from any swap once the wishlists have been exchanged. - All items must be wrapped. - All packages must be shipped in cardboard boxes, not bubble mailers, unless you have spoken to me regarding this. 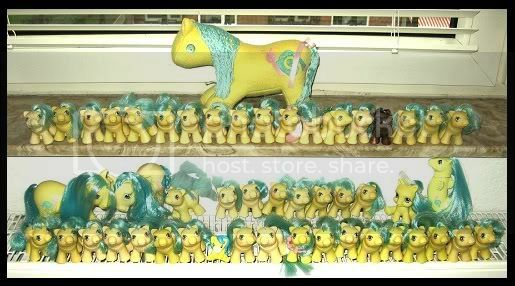 - All ponies purchased for your swap partner must be on their swap list. - If your partner has a pose army try to buy different ponies of that pose and not all the same. - Extras are not compulsory, but are generally expected. - Extras do have a monetary limit of $5 in this swap. Please do not exceed this since this swap is already pretty expensive. - Please don't send wet ponies. - The secret word is: Beetlejuice! - A card, store bought or hand made, telling your swapper who you are is appreciated! - The swap limit DOES NOT include the costs of ANY shipping. Please keep this in mind. -A teaser post is required, this will be started by me. - A brag post is also required so I can ensure you have received your box. The brag post has to include a pic of the new ponies with your army. - The swap is secret, so we will not reveal your swappers surprise, and I ask that you keep the secret until your box has been received. - Please ship on time. If you need additional time, or need to ship early, please let me know urgently. - If you have any questions please feel free to PM me! - Airmail only for international, no exceptions. - For US residents shipping to US residents, first class may be used but Priority mail is encouraged. - Postal receipts are required; if something goes missing I will need to check. - Delivery confirmations and/or insurance is highly suggested. - Ponies should be well wrapped for shipping. - You must be willing to ship international. - PM me to let me know that you have shipped your person's ponies. This is a must. I have to know once you ship your package. - Please also let me know that you have your shipping receipt and which shipping method you chose. - Don’t ship before the deadline! - Gifts must be wrapped in gift wrapping paper. - Do not use newspapers or colored tissue paper, this could stain the ponies. - Do not ship wet ponies. - Do wrap ponies individually before boxing. - Do use some sort of padding like bubble wrap, white tissue paper, peanuts, etc. - Not buying early enough. - Letting it slip who your secret person is. - Not being exact about flaws you will/not accept. - Not asking for advice when needed. - Not turning in Wishlist on time. When shopping for ponies, keep in mind that ponies may not have ingrained dirt, smooze, cancer or mold. Haircuts are ONLY acceptable if your swapper indicates this on their Swap Form. Ponies may not have nibbles or chunks missing. Ponies need to be in or close to NEAR MINT condition unless specified. You may only ship baits if your partner allows it. If you are interested here’s what you need to do! I hope we will have a lot of fun everyone!!! Hmm... I'm thinking about it.